In many ways, the development of railroads in the United States during the Nineteenth Century mirrored that of the nation itself. As the still young country's population and economy grew, so too did the many "ribbons of steel" that crisscrossed the expanding land to provide it with the many new lines of communication necessary to support the transformation of the United States from an Eighteenth Century confederation of former British colonies nestled along the Atlantic seaboard to a Twentieth Century continent-wide industrial giant. Although these many new railroads came in all sizes, the myriad of challenges, successes, failures, political conflicts– and frequent financial scandals – that faced each one, large or small, were remarkable in their scope and diversity. While many of the great “main lines” built in the United States during the Nineteenth and early Twentieth Centuries are today still key arteries of the nation’s commerce, unfortunately a great many of the country’s short line railroads have long since been abandoned. Some, however, still survive – and indeed flourish – despite, in many cases, very long odds. Although many sections of the original grade of the combined Central Pacific-Union Pacific route have been realigned or relocated since it was completed in 1869, this first transcontinental railroad to California and the Pacific remains one of the nation’s busiest and most important transportation corriders. 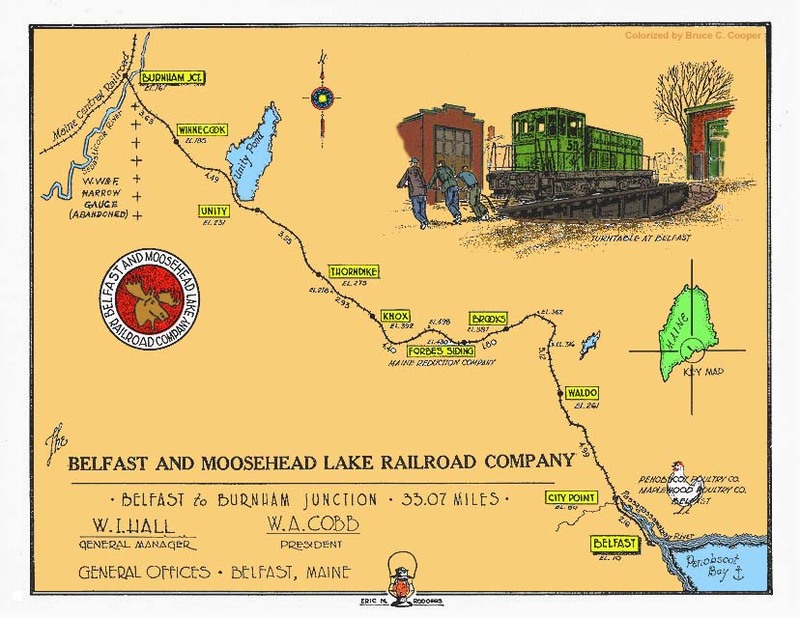 At the opposite end of the country, meanwhile, its much smaller short line contemporary, the 33-mile long, single track Belfast & Moosehead Lake Railroad lives on as well. Located entirely within the boundaries of rural Waldo County, Maine, the B&ML’s “last spike” was driven a mere sixteen months after Leland Stanford hammered in the Pacific railroad's “Golden Spike” at Promontory Summit, Utah Territory, on May 10, 1869. Although minuscule when compared to that great Pacific road, ironically the B&ML’s formal gestation period from initial concept and first survey to completion was actually a good bit longer – almost three-and-a-half decades! And as with the Pacific railroad, political machinations, opposition from vested interests, and financial controversies were all a part of its story too. What follows is a brief history of this colorful and resilient short line contemporary of the Pacific railroad which, until just a few years ago, was the only remaining municipally owned and operated railroad in the nation. And as it was with its much larger transcontinental counterpart, it is a story of vision, greed, heroic effort, “sharp tactics”, enterprise , scandal – and most importantly survival. 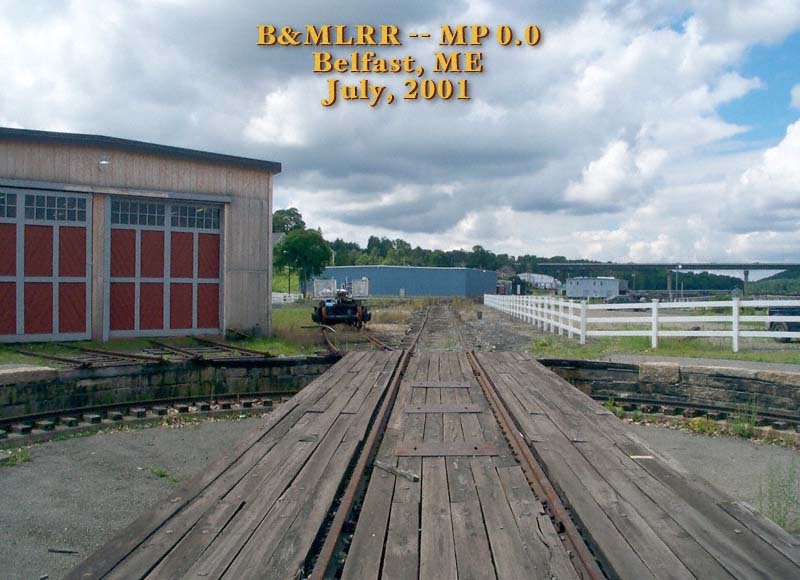 From the August, 1868, start of construction of the B&ML in this Belfast waterfront location, until the yard tracks seen here were pulled up in early July, 2005, this plot of land served continuously as the Belfast & Moosehead Lake Railroad's main yard and the location of MP 0.0. 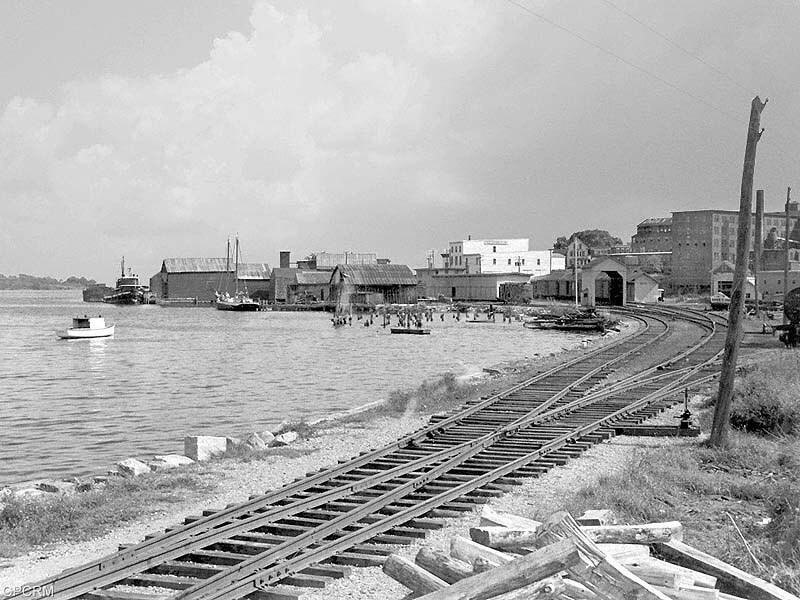 This late 1940's view of the yard shows the freight house and B&ML offices located just off the water next to Marshall's Wharf. The passenger station and platform, baggage room, and mail room stand just across the tracks and are visible just behind the covered scales. The man powered "Armstrong" turntable and engine house can be seen to the right behind the telegraph poles. The freight house still stands today and is now the home of the "Belfast Maskers" theater. The turntable was removed in June, 2005, followed by most of the yard tracks a few weeks later. Photograph courtesy of Mack Page, Sr., of the City Point Central Railroad Museum. Early 1960's era route map of the B&ML. For the first 44 years of the nation's history its northeastern most frontier was not a state, but a vast, almost completely forested "District" belonging to Massachusetts, one of the thirteen original states. With the development of its lumber and agriculture, and the increased settlement along its maritime coast, Casco Bay, and the Penobscot Bay and River region, however, the "District of Maine" finally broke off from its progenitor to the south to join the Union as a sovereign state in 1820. At about the same time the first railroads in the United States were being laid down as horse-drawn tramways in such places as the curiously named Mauch Chunk, Pennsylvania, Quincy, Massachusetts, and along the Delaware & Hudson Canal. 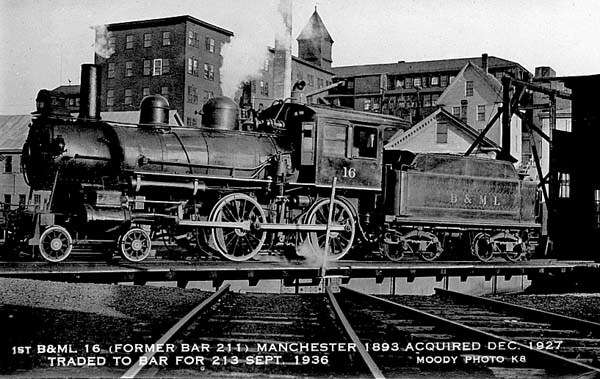 By 1836 some of the land's bigger pioneer railroads such as the Baltimore and Ohio (1827) and Maine's own first line, the Bangor, Milford and Oldtown, had already been established. The innovative late John Stevens and his sons, Robert L. and Edwin A. Stevens, had also just completed the famous Camden & Amboy (1834) across New Jersey to provide the first rail service between the young nation’s two most important cities, Philadelphia and New York. For locomotion Robert Stevens went to England where he purchased the famous steam engine, the "John Bull," which was restored to operational condition in recent years by the Smithsonian Institution. 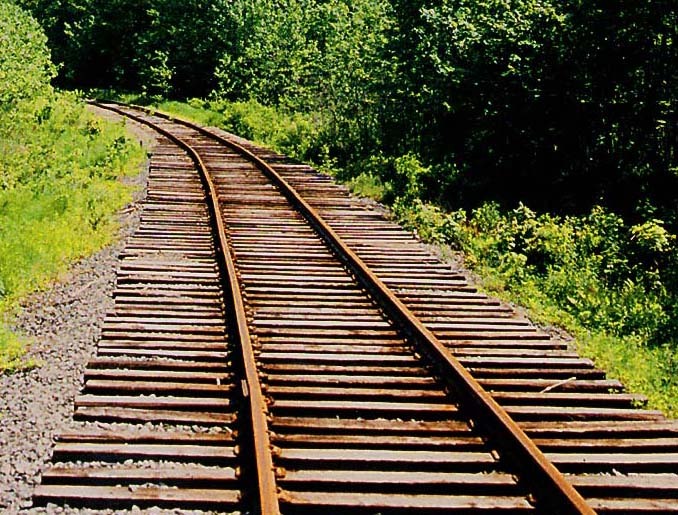 While traveling over by ship Stevens also devised both the famous "T" shaped rail and the hooked railroad spike which for more than a century-and-a-half now have been the standard for all of the world's railroads. 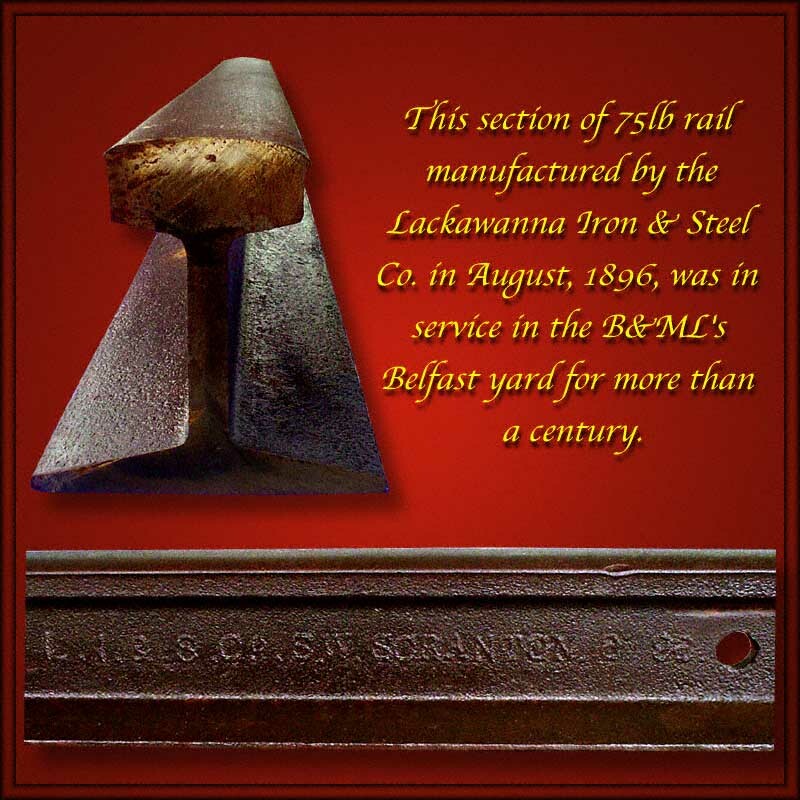 This section of branded 75lb rail, which was in continuous use in the B&MLRR's main yard in Belfast, ME, for more than a century, was manufactured by the Lackawanna Iron & Steel Company, Scranton, Pa, in August, 1896. Meanwhile in Maine plans for another proposed railroad were being hatched to connect inland Quebec to one of the growing seaport towns along the young state's coast. At the request of the Maine Legislature, the U.S. Government sent Col. Stephen H. Long, an Army topographical engineer, who (along with Capt. P. Yule of the Royal Engineers) conducted surveys to find the most practical route. 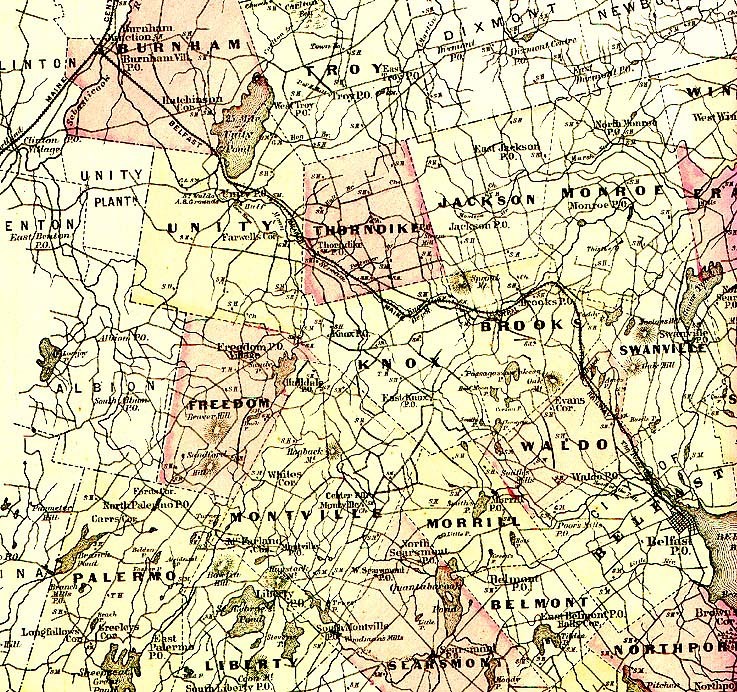 Of the three that were investigated – from Portland, Wiscasset, and Belfast – that from Belfast, the growing shire town of Waldo County, was determined to be both the shortest (by nineteen miles over Wiscasset and fifty over Portland) and best suited. Under Long's supervision, two parties of about 15 men each began the surveys on June 6, 1836, and completed them in November. In his report to Governor Robert P. Dunlap of Maine, Col. Long recommended a route into Quebec of 227 miles from "Belfast to the Forks of the Kennebec, and by a line of levels thence to the Canadian line." Ironically in the summer of 1820 – the year Maine joined the Union – the same Stephen Long had led the first formal government topographical and scientific expedition out the Platte River Valley from Council Bluffs proceeding as far west as Long’s Peak in what is now Colorado before turning south and east again. A half century later the Platte valley would become the route of the easternmost portion of the Pacific Railroad. In a report about this survey entitled General Description of the Country Traversed by the Exploring Expedition, Long propounded what became known as the “Great American Desert” myth about the plains which for the next several decades did much to discourage any serious attempts at western settlement. 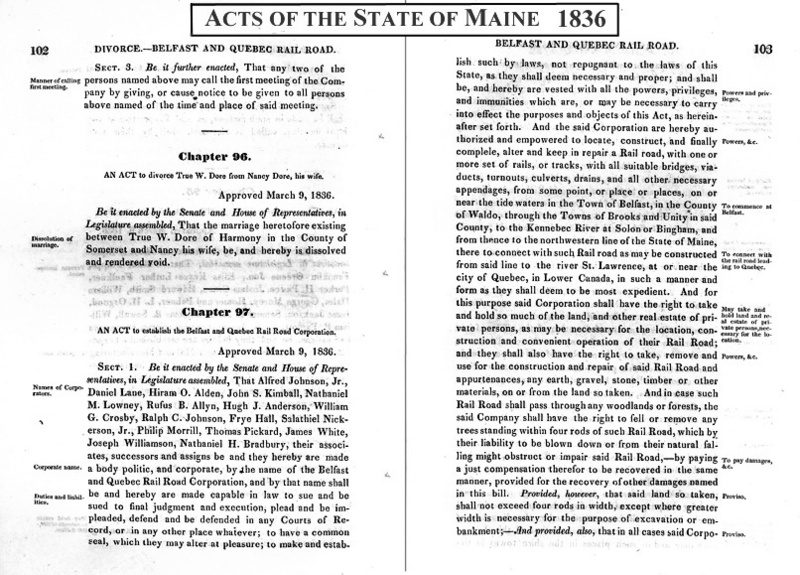 Excitement and support for the project soon grew and on March 9, 1836, the Maine Legislature passed "An Act to establish the Belfast and Quebec Railroad Company." All that was then needed was for Parliament to incorporate a similar company in Quebec – and for the line's proponents to raise the money to build such an ambitious project! Although Quebec did its part, unfortunately both a provision in the Maine Constitution which prohibited public loans for such purposes and the financial panic of 1837 quickly intervened to kill Belfast's first railroad venture before it could ever get off the ground. In 1845 Belfast tried to revive the Quebec project but financing again failed as it did for another proposed line chartered by the Legislature in 1848 from Belfast to Waterville. Over the next twenty years or so, new roads such as the Boston & Maine, the Portland & Kennebec, and the Maine Central developed the inland routes from Boston up to Portland, Augusta, Waterville, and Bangor of which the latter three cities all communicated with the coast by either the Kennebec or Penobscot Rivers. The growing coastal port towns, however, were still without direct overland passenger or freight service to the outside world except for stage lines or by coastal steamers. 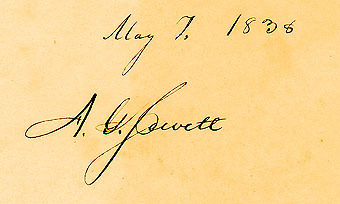 At a large public meeting in Belfast on February 7, 1853, however, interest in a railroad for Belfast was again sparked by Albert G. Jewett, a prominent Belfast lawyer who for the previous three years had operated a steamboat line on the Chagres River in Panama, and who a decade later would become Belfast's Mayor. (From 1845 to 1847 Jewett also served as the U.S. Chargé d'Affaires in Peru during the Polk administration.) The Jewett proposal was for a road running from Belfast via Newport, Dexter, and Dover, to Greenville on the shores of Moosehead Lake, a distance inland of about 88 miles. As before, however, financing did not follow for a variety of reasons including opposition by those who wanted to build a canal inland from Belfast and were not interested in railroad competition. Although no canal was ever built (nor because of the grade inland did one seem really practical), it was enough to discourage investment in a railroad at a time of already overextended and undercapitalized Maine railroads. Thus Jewett's plan also faded without a single foot of line being graded. he finally saw one chartered in 1867. A decade later the Civil War also drained off any possible sources of capital for a railroad to Belfast, but ironically that tragic conflict provided the nation with an even greater awareness of the value of the iron roads. Without its superior rail network the North would have doubtless had a far more difficult time winning the war. A prime example of General Robert E. Lee's understanding of this fact was his decision to send his Army of Northern Virginia into Pennsylvania on a dangerous venture to capture and destroy the Union's key rail hub at Harrisburg. Of course the result of that invasion was the bloody interception and defeat of the Rebels just to the south of Harrisburg at Gettysburg in perhaps the most famous battle of the War Between the States. One of the key figures of that pivotal Union victory was a young officer from Maine, Col. Joshua L. Chamberlain, whose heroic exploits at Little Round Top with the 20th Maine did much to turn the tide at Gettysburg. At the same time as war raged in the eastern half of the nation, however, two great railroads were just beginning to be built towards each other beyond the Mississippi River both eastward from Sacramento, California, and westward from Omaha, Nebraska – the Central Pacific and Union Pacific – which finally met at Promontory Summit, Utah Territory, on May 10, 1869, to complete the first transcontinental railroad across North America. As those two great lines were conquering the American West, a fifth and finally successful serious attempt took form to connect Belfast to the nation's burgeoning rail network. In 1867 a new state law finally made it possible for cities and towns to help finance railroads through bond issues. With that development Dr. Nahum P. Monroe, Belfast's state representative in Augusta, quickly introduced in the 47th Maine Legislature a Bill to charter the "Belfast and Moosehead Lake Railroad Company" which was passed as Chapter 380 of the 1867 Maine Statutes. On February 28th it was signed into law by the Governor, none other than the same Joshua L. Chamberlain who just a few years earlier had helped save the Union's rail junction at Harrisburg from capture by Lee's Army. This time, however, financing soon began to follow led by the City of Belfast whose Mayor was by then the same Albert Jewett of the failed 1853 B&ML attempt. By margins of 865-27 and 854-50 the people of Belfast voted on April 6, 1867, and March 28, 1868, respectively to authorize the city to issue 30-year, 6 percent bonds to finance their purchase of a total of 5,004 shares of preferred (1,400) and non-preferred (3,604) stock at $100 per share . 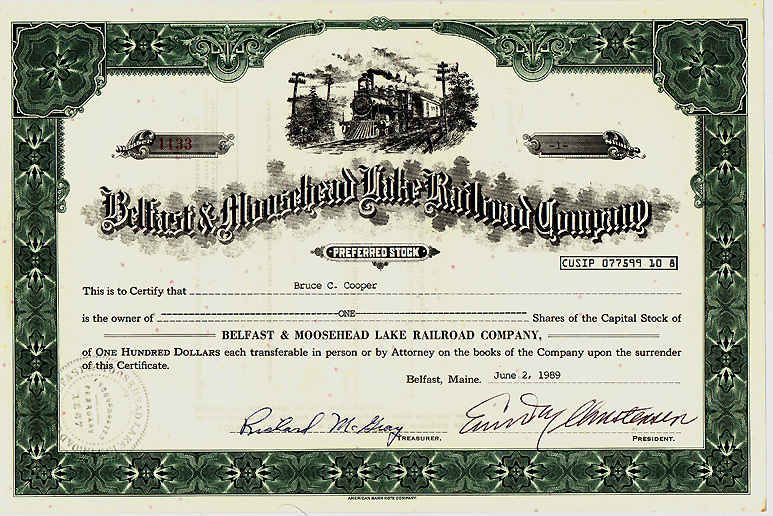 This would eventually represent about 80% of the company’s outstanding shares the rest of which were purchased by several other towns along the line (Brooks, Unity, and Thorndike), and by a small number (about 100) of private investors mostly from Belfast and Boston. With the capital stock of the company exempted from taxation for a period of ten years, the corporation formally organized on July 3, 1867. After a year of planning, making detailed surveys, and acquiring additional financing, on July 8, 1868, a contract was let to Ellis, Wilson and Hogan Co. of Canada to build the line for $25,900 per mile. The road was to be 36 miles in length from Belfast to Newport where it was to join the already under construction line from Newport to Dexter. 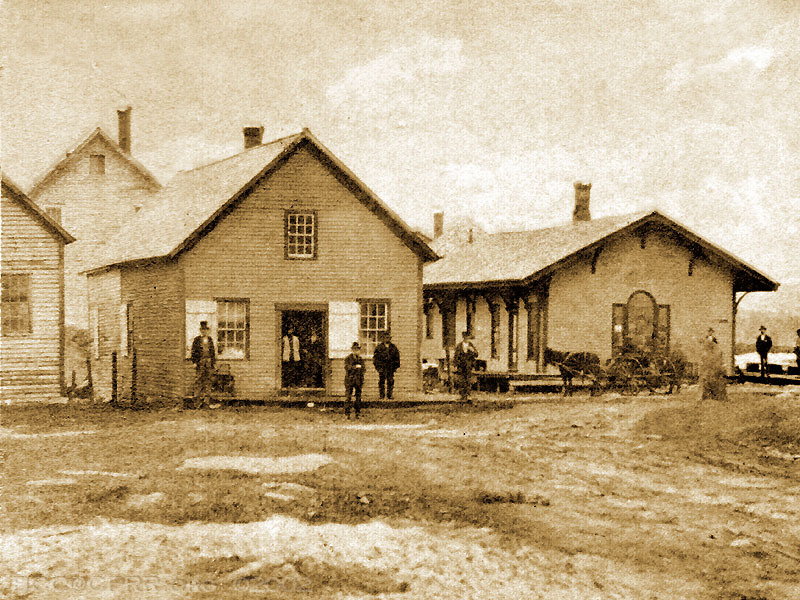 Ground was broken in Belfast on August 4, 1868, with an elaborate ceremony where the passenger station would soon stand. A team of eight oxen then drew a plow along the waterfront line of the road and work was finally under way. Serious financial and political problems, however, were just around the corner. Although over $935,000 had already been pledged when ground was broken, it soon became obvious that additional capitalwould still be necessary to complete the line. 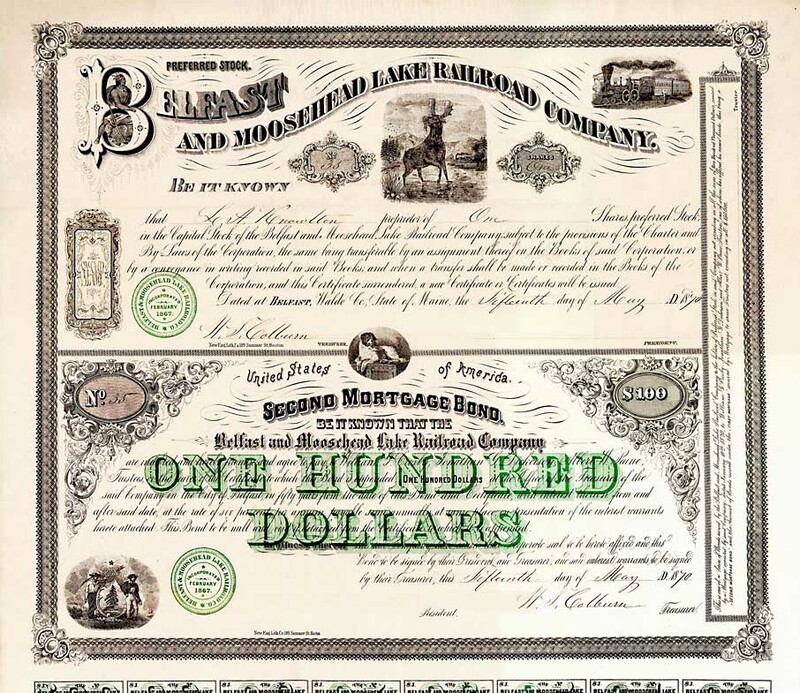 In order to raise an additional $102,000 in capital needed to complete construction of the line, in the spring of 1870, the B&ML offered this unusual “dual security” which combined a share of preferred stock with a $100 Second Mortgage Bond paying interest at a rate of 6% anually. Attached to the Bond are one hundred numbered clipable coupons, redeemable semi-anually for $3.00 each. (Click on the above image to enlarge.) It is signed by the B&ML's Treasurer, William T. Colburn, who also served as the first Belfast stationmaster. In the late 1860s, the Maine Central and the Portland & Kennebec Railroads were bitter rivals which each saw an advantage in establishing a connection with the still under construction B& ML. After considerable jockeying, a fifty-year lease was agreed to with the Portland & Kennebec under which the B&ML was to receive 5 percent upon its cost for the first five years and 6 percent thereafter. Under the agreement the B&ML would also join the Portland & Kennebec at Kendall's Mills and a branch line would be built from Brooks to Bangor. The lease, however, was subject to approval by the B&ML’s stockholders which effectively meant the municipal officers of Belfast. Before that assent could be secured, however, the rival Maine Central made a counter offer to lease the line at 6 percent of the cost of the road provided it did not exceed $800,000, or not over $48,000 per year, with connection to be made to the MEC at Burnham and a completion date of November 1, 1870. These are the schedules of the Maine Central and the Portland & Kennebec Railroads as they appeared in the March, 1868, issue of the American Railroad Guide. Both railroads wanted the soon to be built B&MLR to connect with their line. Although the Portland & Kennebec's offer was clearly the better of the two (it would pay its percentage against the actual cost of building the line), Belfast's City Council – by a one vote majority – ordered that the City's stock be voted in favor of the inferior, limited percentage MEC lease. Not unexpectedly, many charges of bribery and corruption were immediately leveled at the City Council. The multiplicity of suspicious circumstances that surrounded their curious vote, however, were never fully explained. Although nothing was ever "proved" against the suspected parties who had saddled the company with the disadvantageous contract, the scandal that ensued was most memorable. While the railroad's opponents were not numerous, they were determined and powerful. Because of the violation of the B&ML's by-law that no assessment could be levied or work begun until the full amount necessary to complete the line was subscribed, there were threats of a lawsuit. So apprehensive were the city fathers that such a suit would actually be brought that the City Treasurer hastily resigned and five others were elected before one could be found who actually agreed to serve! Nonetheless the MEC lease provided the B&ML with the means to access the funds needed to complete the line and construction proceeded. 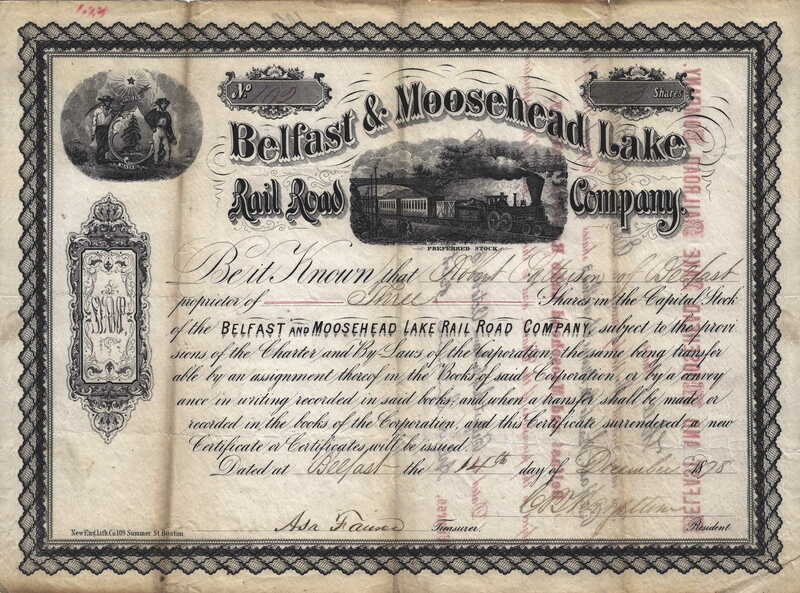 Stock certificate #102 for three shares of capital stock in the Belfast & Moosehead Lake Rail Road Company made to Robert Patterson of Belfast dated December 14, 1878. The lease specified that the B&ML would be responsible for building the line while the MEC would run the trains. This, however, immediately caused another problem as the B&ML was being constructed using the wide "Portland" gauge in which the distance between the rails was 5' 6" while the MEC had recently converted to the new "Standard" gauge of 4' 8 1/2". 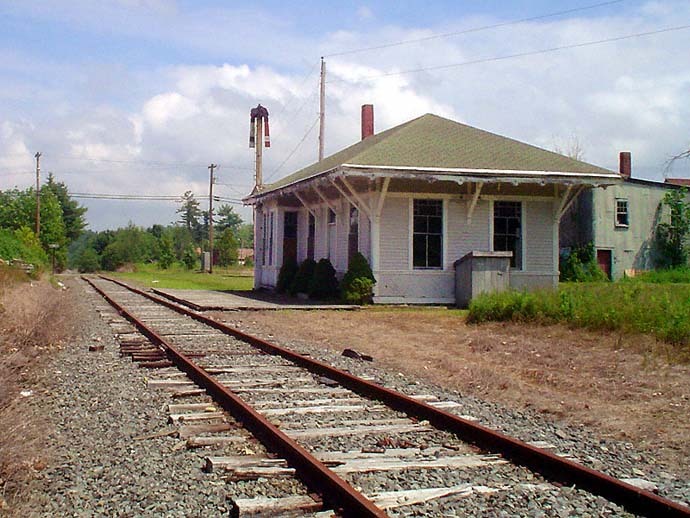 (According to a report in the Janaury 28, 1870, issue of the Portland (ME) Weekly Advertiser, the Maine Railroad Commission had still not settled the thorny issue of establishing a single gauge for use by all the railroads in Maine.) As the B&ML would now connect to the MEC at the far end of Waldo County instead of proceeding on its own to Moosehead Lake, it was necessary that the two lines be of matching gauge leaving the question as to who was going to pay to relay those 33-miles of rail already in place between Belfast and Burnham. 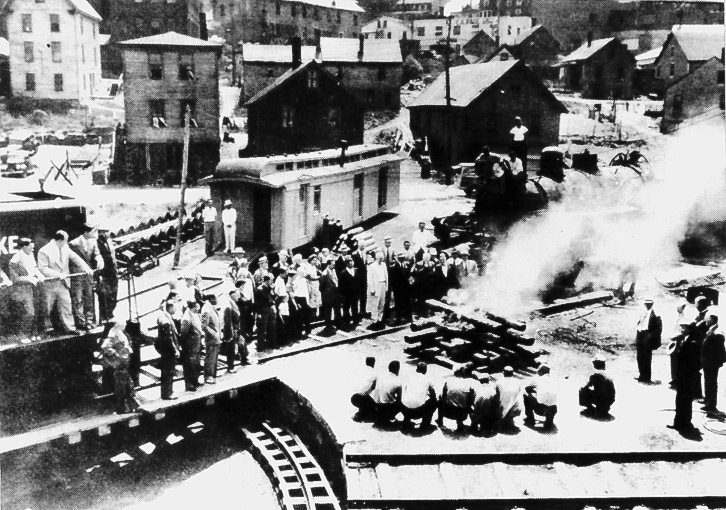 While that dispute was being settled, the "last spike" of the long-planned road was driven near Brooks on September 24, 1870, and the contractor's locomotive "Windsor" made an inaugural trip pulling two flatcars full of thrilled townspeople from Burnham and Unity. The contractors then spent the next six weeks narrowing the gauge of the track to "Standard" and on November 1st the line was declared "open for travel." 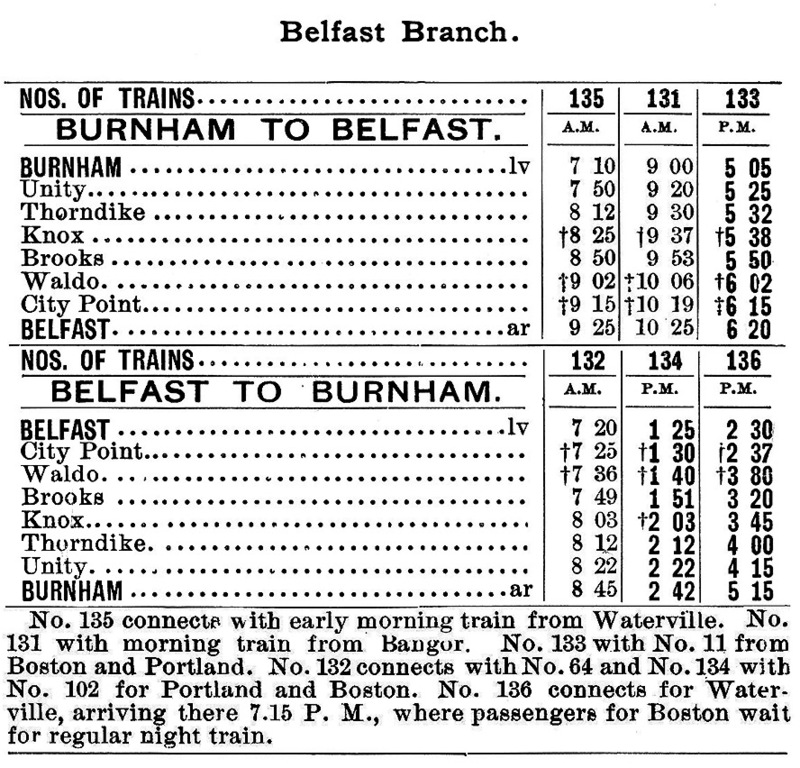 After some 35 years of planning and ultimate construction, the first scheduled train from Belfast finally ran to Burnham on December 23, 1870. 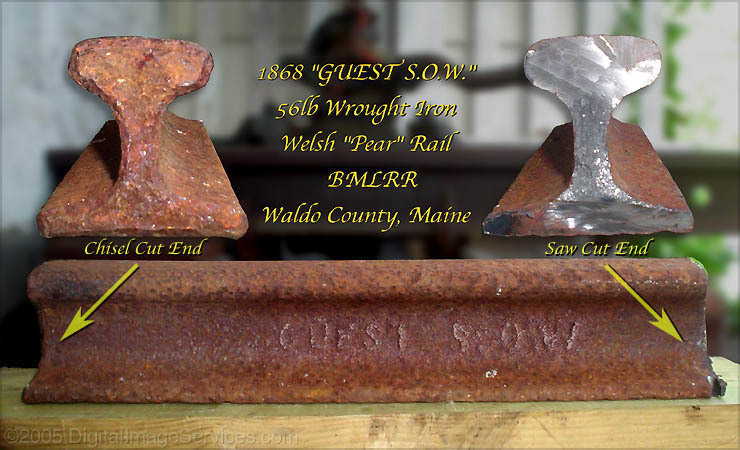 The B&MLRR was originally laid with 56lb wrought iron Welsh "Pear" rail during its construction between August, 1868 and December, 1870. 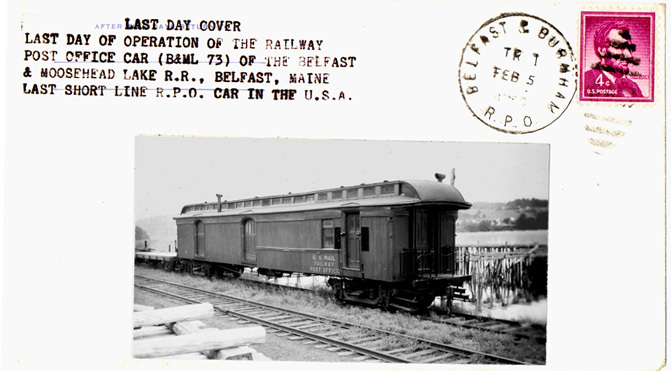 This rail was all replaced within a few years, however, with heavier American rolled steel rail (first by 67lb, then 75lb to 85lb) by the Maine Central which operated the line under lease from 1871 to December 31, 1925, as the MEC's Belfast Branch. The original construction rail is branded "GUEST S.O.W." and came to Belfast by ship from Wales. This rare example was found along the B&ML grade near a bridge over Westcot Stream by Mack Page, a member of the fourth generation of his family to have worked on the B&ML, and the founder and owner of the City Point Central Railroad Museum. 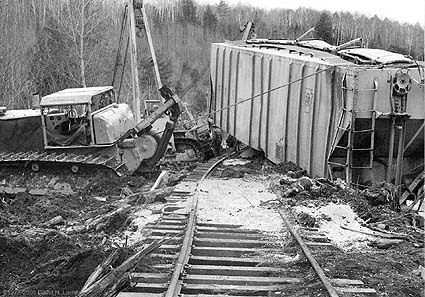 While much of the right of way went through relatively open country, there had still been a number of difficult challenges for the engineers and construction crews to overcome. Parts of the line near Waldo and Unity, for instance, would have to literally be "floated" through bog land on unusual double length ties. Elsewhere deep and expensive cuts had to be made through extremely hard granite formations. Just beyond Waldo Station, about eight miles inland from Belfast, the B&ML’s route takes it through swampy bog land. To accomplish this safely this stretch of rail is laid on double length ties approximately 11 feet long which literally “float” the road over the bogs. While construction was now complete, the line's early "political" problems were still far from over. Since the negotiation of the lease with the MEC, that line and the Portland & Kennebec had merged. When it came to accepting the new branch, therefore, the old Portland & Kennebec directors who now sat on the MEC Board representing the P&K stock were still stinging from the shabby trick that Belfast's City Council – as the B&ML's majority stockholder – had played on them. Before the fifty-year lease was to finally be signed, therefore, there was to be some "renegotiation" that would make it even more unfavorable to the B&ML. With the line already connected to the MEC at Burnham and the P&K no longer a separate road, the B&ML had no leverage – or option – but to go along with whatever the MEC demanded. Thus when the lease for the B&ML was finally signed on April 27, 1871, it was for a reduced annual payment of $36,000 which, after debts were paid, realized the city an annual income of just $27,116.80. The original passenger station at Belfast (right), c. 1880. 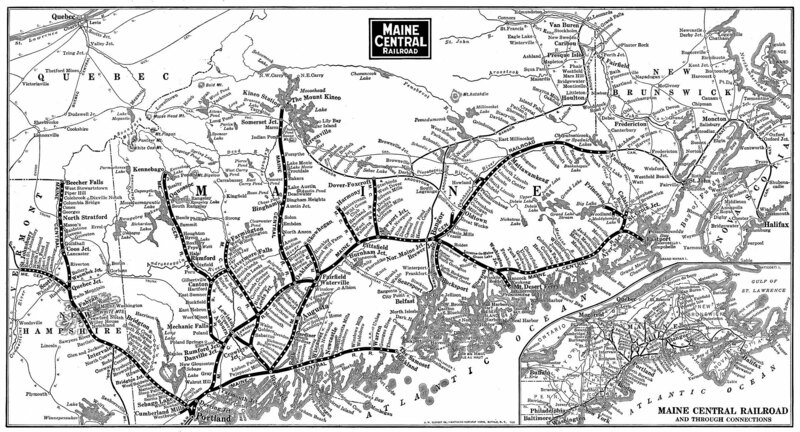 Map of the Maine Central Railroad from its 1886 Annual Report. While the Maine Railroad Commission noted in their 1870 Annual Report that the new line was "well constructed," there were some deficiencies that were noted, such as ditching, filling, and ballasting, which were all corrected in the first few years of operation. By 1873 the line's wooden bridges (later replaced with steel) were also covered as was the practice on the Maine Central. The line was also extended along the waterfront to the town's wharves in order to better accommodate the delivery and receiving of freight. 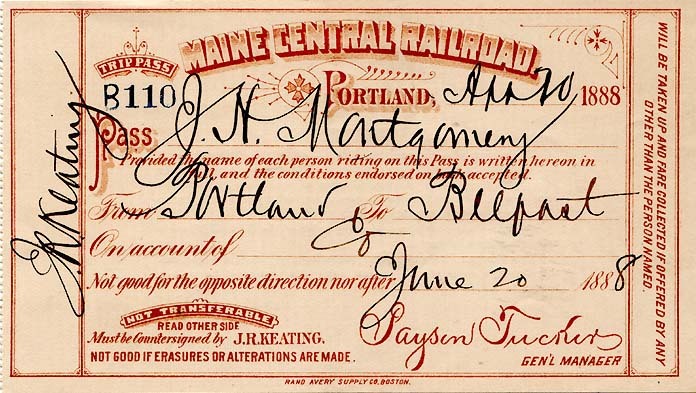 This 1888 Maine Central Railroad "Trip Pass" authorized travel on company business from Portland via the main line to Burnham Junction and then over the Belfast Branch (the leased B&MLRR) to Belfast. By 1880 much of the long bridge over Unity Pond was filled in, leaving just 65' remaining over its outlet, while the bridges at Marsh Stream near Brooks and at City Point were also rebuilt. The trestle work at Belfast, the site of the line's Water Street yard and main station, was also filled in at this time. 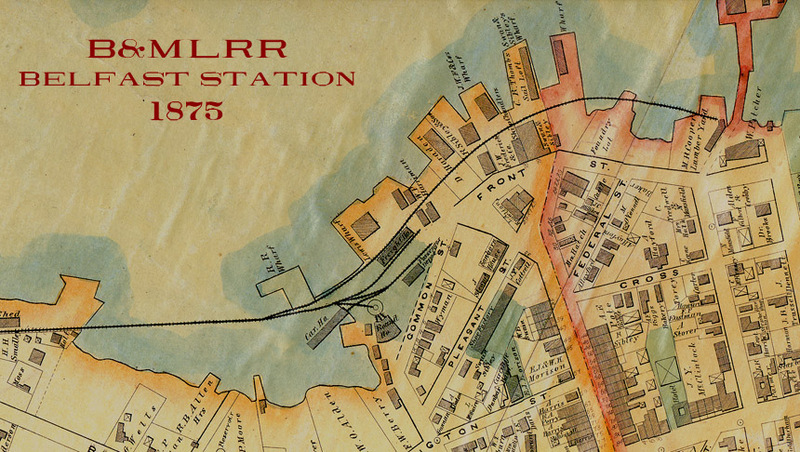 As shown in this 1875 map of Belfast, the city’s newly completed railroad provided direct rail connection to all the main wharves on it’s busy harbor on the Penobscot Bay. 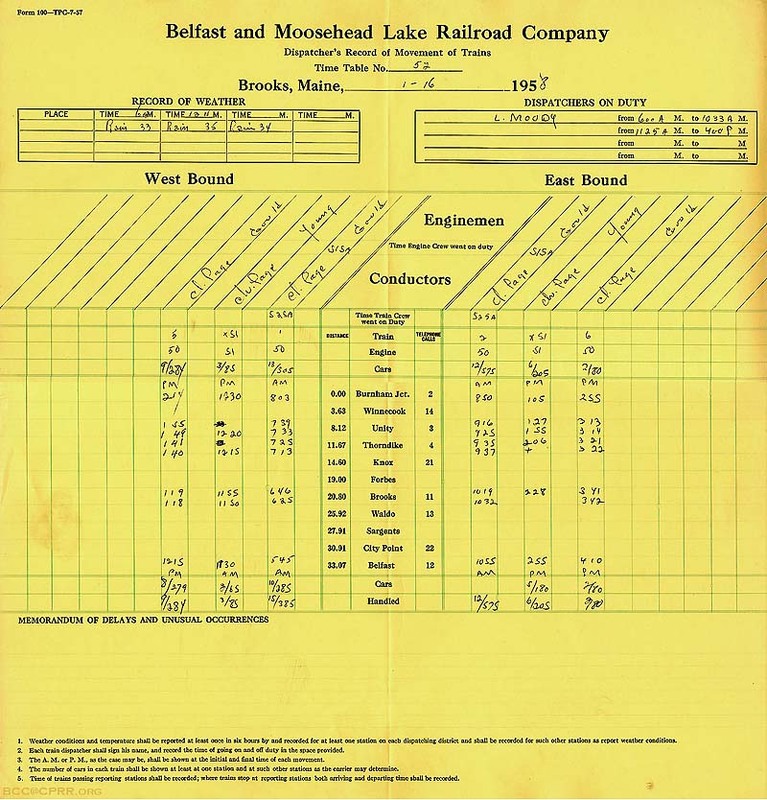 Maine Central Railroad (Belfast Branch) Schedule – 1895. 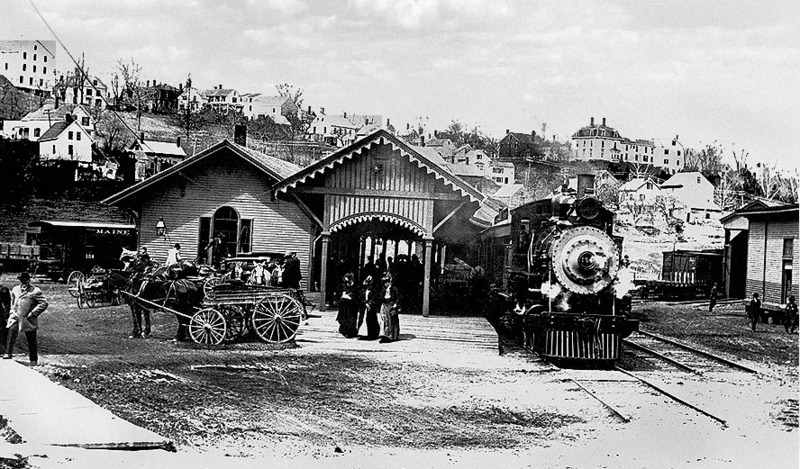 This view of busy Belfast Station was probably taken about 1900, about half way through the Maine Central’s 55-year tenure as the line’s operator. While the original idea for the railroad to Belfast was to bring freight business to the port from inland, with the MEC running the line the result was often the opposite. Much of the line's freight business consisted of moving the products of Waldo County inland for transportation over the MEC while much less came the other way. Nonetheless the Belfast branch was a fairly busy operation with as many as three round trips a day running between Belfast and Burnham of which two carried passengers. Over the years the MEC also made many physical improvements to the line. The original 56-pound rail, which had been imported to Belfast by sailing ship from Wales, was eventually replaced with heavier gauge track and all but the two Westcott stream bridges near Waldo had been replaced with steel spans by the time the MEC finally canceled its lease for the line. The B&ML was operated under lease by the MEC as its "Belfast Branch" from the time it opened in early 1871 until December 31, 1925. This view of the MEC's main yard in Belfast dates from early in the 20th century. Note the the area to the left of the main line heading out of the yard has not been filled in and is occupied by tidal waters from Belfast Bay and the original shoreline. The old Lower Bridge was replaced by a new concrete structure in 1921 and within a few years began to carry U.S. Rt. 1 across the Bay. (That structure became a foot bridge when the Rt. 1 bypass and new high bridge were opened a few hundred yards further up the river in 1964.) The railroad freight house was located along the Bay shore just out of frame to the right. By 1925 America's railroads had already passed their peak and, like many other lines, the MEC was downsizing. First it sold off its two foot narrow gauge line, the Sandy River and Rangeley Lakes, and then abandoned the Hereford Railway it operated in Quebec. 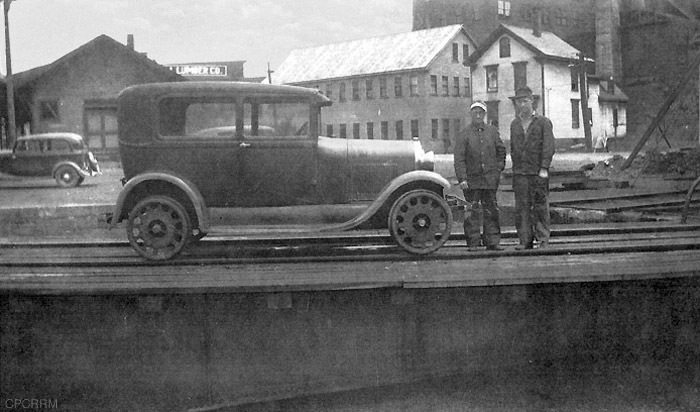 Claiming a net loss on operations on the Belfast Branch exceeding $110,000 a year, MEC president Morris McDonald formally notified the B&ML's Board of Directors in June, 1925, that it was giving the required six-month notice that it intended to cancel its then 55-year old lease on the line and would no longer operate the Belfast branch thereby leaving its majority owner, the City of Belfast, with two options – either to run the railroad itself, or to scrap it and leave Belfast, City Point, Waldo, Brooks, Knox, Thorndike, Unity, Winnecook, and the rest of Waldo County without rail service. 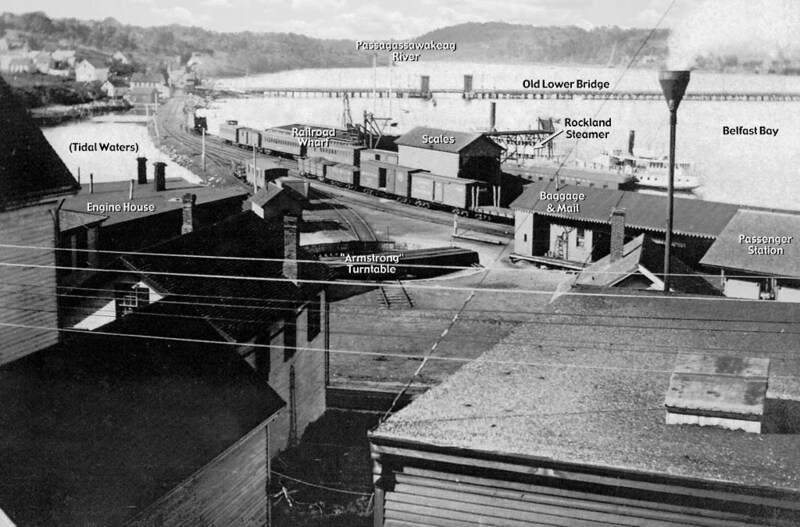 When attempts to negotiate an outright sale of the line to the MEC failed, the B&ML Board reluctantly decided on October 27, 1925, that it had no option but to actually go into the railroad business. 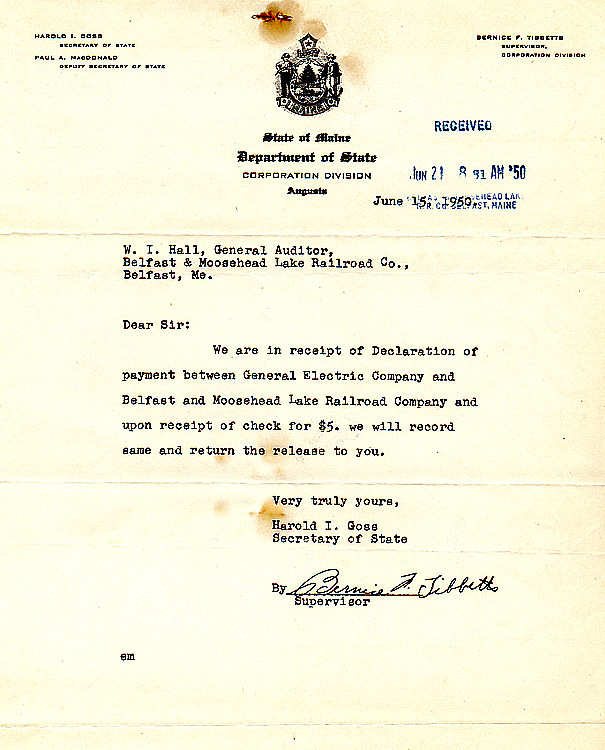 And so two months later on January 1, 1926, for the first time in its history, the 33-miles of track from Belfast to Burnham would finally be operated under its own name – the Belfast & Moosehead Lake Railroad. H. P. Crowell, a veteran railroad man from Vermont, was hired as General Manager, and, with a loan of $5,000 from Belfast businessman Orlando E. Frost, the B&ML's unpaid president, the railroad was in business. While Crowell started to hire a staff and work out hundreds of operational details to get the line running smoothly, one major problem had to be addressed immediately. The company had no rolling stock of its own as everything that was "movable" – including of course locomotives and cars – reverted to the MEC with the cancellation of the lease. 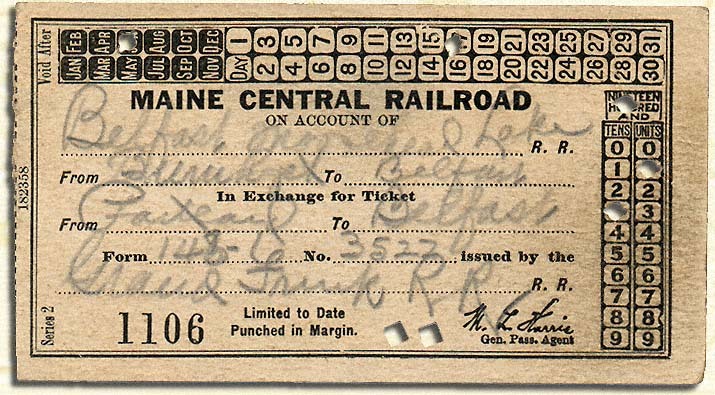 Maine Central Railroad (MEC) Exchange Ticket good for passage over the B&MLRR from Burnham Junction to Belfast on June 17, 1931. For the first month of independent operation two locomotives, a baggage car, and a passenger car were leased from the MEC, and then for another year or so similar equipment was leased from the Boston & Maine. In 1927, however, the B&ML finally began to purchase its own very well used rolling stock. 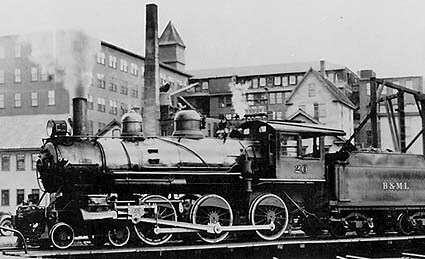 In December of that year the B&ML acquired its first locomotive – a 4-4-0 Manchester built in 1893 from the Bangor and Aroostook Railroad which became B&ML #16. Over the next eighteen years the B&ML traded for or purchased six more veteran steam engines from the BAR, the last of which, #61, was forty-four years old when it was acquired in April, 1945.
which is still in use today in the Belfast trainyard. 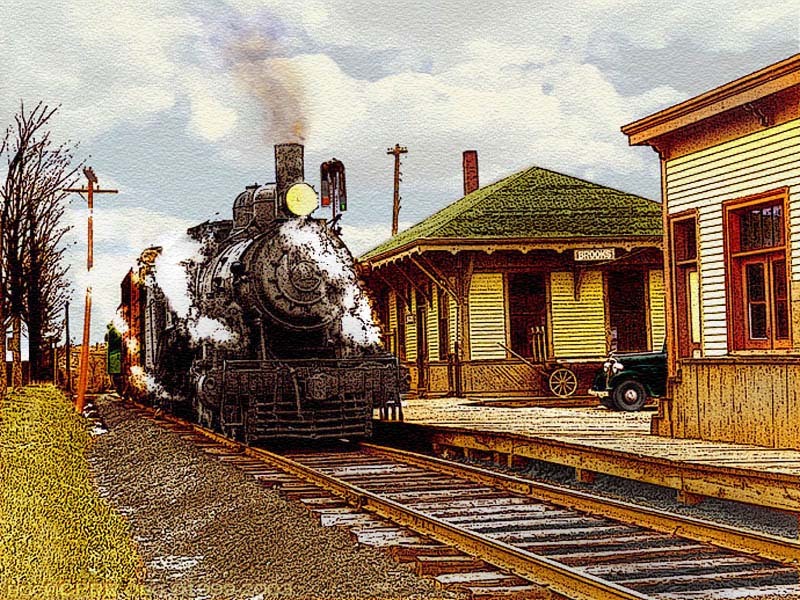 The line also continued to acquire more coaches, baggage cars, cabooses, freight cars, snow plows and and several baggage/express/RPO (Rail way Post Office) cars over the years, all of which were second or often third hand. One of the most unusual pieces of rolling stock was a unique track inspection and fire patrol car dubbed "Motor 90." It was actually an old red 1929 Model "A" Ford sedan with flanged wheels installed in place of tires. This beloved motor car derived its line number from its original cost to the railroad - $90 (+$1.25 tax). All of this equipment got plenty of hard of use through the years of long, cold Maine winters and short summers. Track inspection and fire patrol car BML "Motor 90" sitting on the "Armstrong" turntable in the Belfast yard, c1935. A red 1929 Model "A" Ford sedan with flanged wheels installed in place of tires, this car derived its line number from its original cost to the railroad - $90 (+$1.25 tax) - when it was acquired in March, 1933. 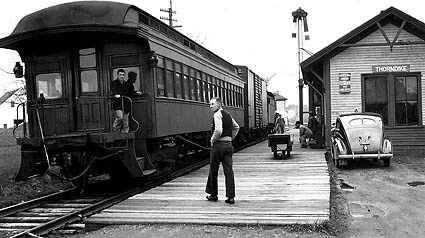 In its first year of independent operation the line carried almost 112,000 tons of freight and almost 43,000 passengers, but within a few years that fell off drastically as the Depression hit rural New England harder than most parts of the country. By the late 1930's freight tonnage was under 50,000 per annum and fewer than 5,000 passengers a year boarded the B&ML. The line's employees, however, were loyal and dedicated – and also happy to have a job at all during the depths of the Depression. Many such as conductor Pat Shaw, engineer Don Gould, auditor and later General Manager Walter L. Bowen, Brooks station agent and famous railroad historian and photographer Linwood Moody, and longtime auditor Wilfred Hall (who also finished his career as the line's manager) all gave decades of service to the B&ML. So too did four generations of the Page family who served on the line over a period of more than a century. Detail of the Main Central's 1932 System Map showing its connections to the B&ML. 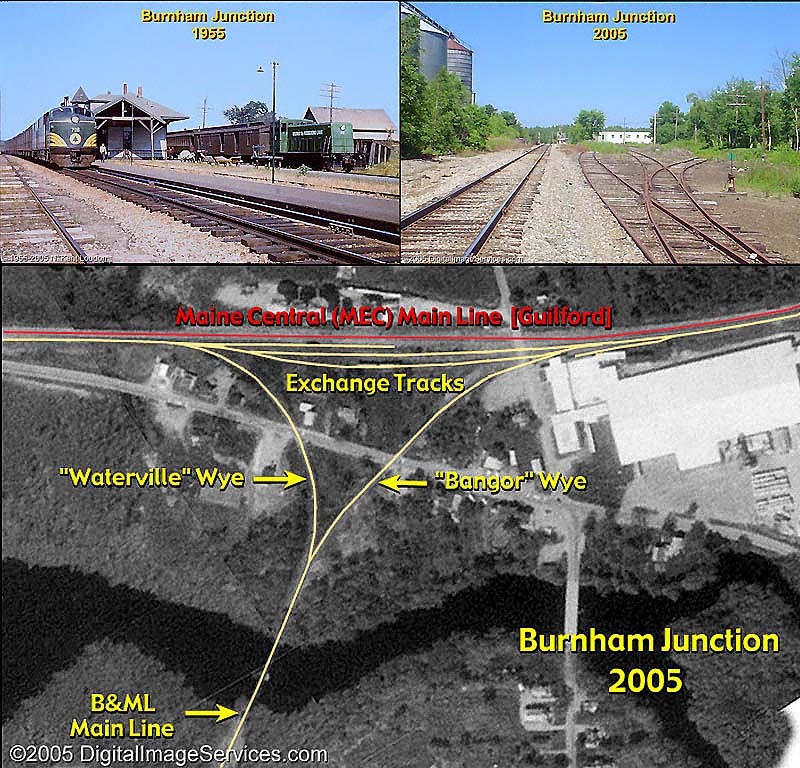 From its opening to the public in 1871 until scheduled point-to-point passenger service on the B&ML ended on March 9, 1960, people, mail, and express traveling outside of Waldo County changed to and from the Maine Central's long distance passenger trains at the two roads' jointly operated station at Burnham Junction as shown in the above detail of the MEC's 1932 system map. 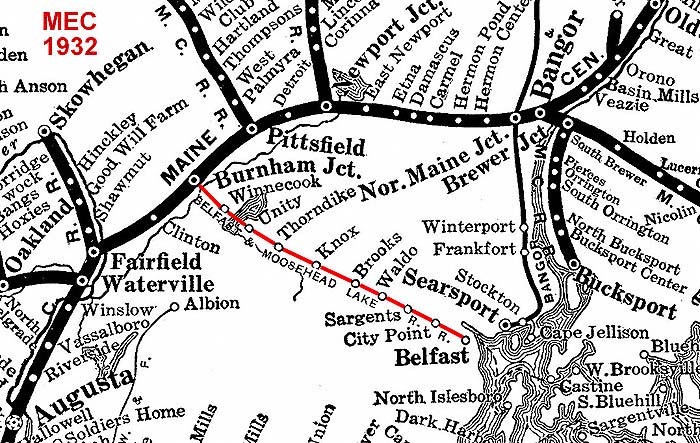 For most of that time, daily early morning and early afternoon passenger trains ran the 33 miles to and from Belfast to connect with the Maine Central system. 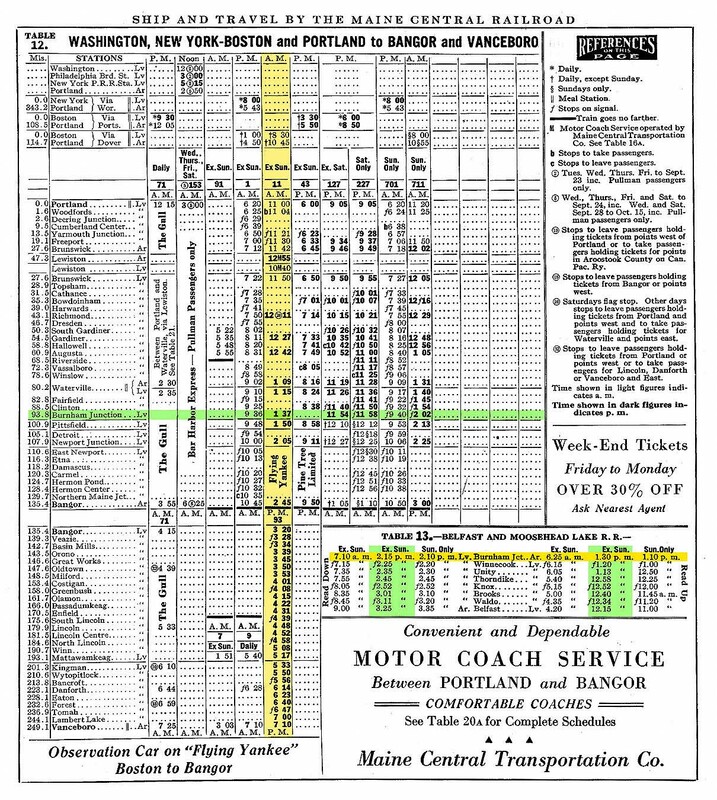 (See the 1944 B&ML PTT below, and the MEC's June 27, 1932, Northbound and Southbound connecting schedules as examples.) The B&ML's afternoon run was timed to meet both the MEC's Northbound (TR#11) and Southbound (TR#102 ) "Flying Yankee" service between Bangor, Portland, and Boston. In April, 1935, that prime run became a then cutting edge deiselized streamliner service when the B&M and MEC jointly began operating a new state of the art Budd built articulated three car (power/baggage/passenger "A" unit, passenger coach "B" unit, and parlor/observation "C" unit) Burlington "Pioneer Zephyr"-type train set over this route. From 1935 until 1947 (when the B&ML finally deiselized) this shining stainless steel streamliner would have been met across the platform by a B&ML consist of a 1901 Manchester 4-6-0 stream locomotive pulling an 1897 wooden baggage/RPO, a pot belly stove heated 1907 open vestibule Harlen & Hollingsworth built coach, and sometimes even a few freight cars. The visage of these two trains sitting a platform width's apart each afternoon certainly provided a most remarkable contrast for travellers of these two starkly different eras of railroading! BML#19 pulling a westbound mixed consist stopped at Brooks in 1947. Passenger traffic naturally picked up quite a bit during the war years with gasoline rationing and a shortage of tires, and the B&ML also sent thousands of car loads of food and dairy products to war over the line. With the end of hostilities in Europe and Asia in 1945, however, the B&ML's business dropped again and it became clear that if the line were to survive it would have to become far more efficient. Much of its equipment at that time was approaching the half century mark in age and had been rebuilt so many times that almost none of it was still original. While the B&ML's resourceful staff were able to keep the line running with remarkable reliability, it had long ago been dubbed the "Broken and Mended" because of the frequent repairs its rolling stock required. Fortunately there was an answer to the B&ML's equipment inefficiency problems – diesel power. The matter of converting the railroad from steam to diesel first came up at a Board of Directors' meeting on November 26, 1945, as reflected by the following minute: "The matter of diesel powered locomotives was broached and it was the unanimous decision of the Board to secure detailed information regarding cost and practical utility value to the railroad." Six weeks later on February 4, 1946, the unpaid Board authorized General Manager Walter Bowen to negotiate the purchase of a pair of the General Electric Company's new 70-ton Diesel electric locomotives – the first two pieces of NEW equipment the line would ever own! The two new engines, numbered 50 and 51, were delivered to the line in late November and were soon hauling freight and passengers with remarkable efficiency thus opening a new era for the B&ML. 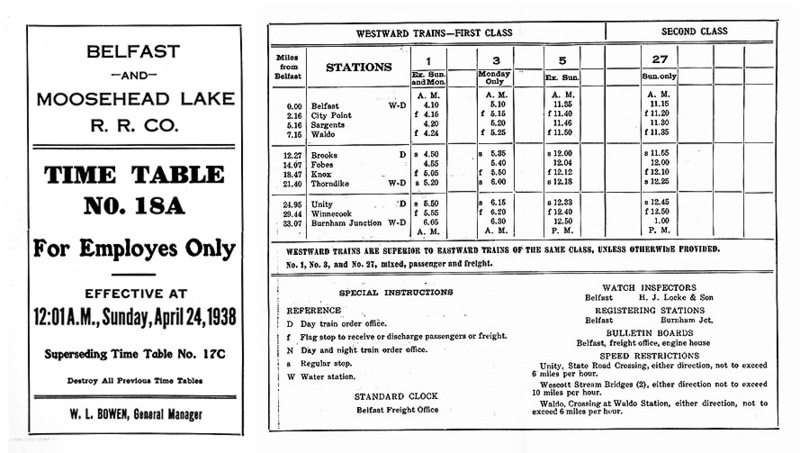 B&MLRR System Passes for 1939-40 and 1950-51. The new 660 horsepower locomotives not only were able to provide 60 percent more traction power than any of the three 1901 vintage Manchesters still owned by the B&ML, Nos. 19, 20 and 61, but also did so at a savings in fuel and labor costs of up to 80 percent! This new economy of operation turned the B&ML from a money loser into a profitable line almost overnight. The line did so well with its new power, in fact, that it was able to pay off the $104,000 cost of the new engines by June, 1950, which occasioned a well attended celebration held next to the hand-powered "armstrong" turntable in the Belfast train yard at which the mortgages for the two engines were ceremonially burned on a pyre of old railroad ties. A third new 70-tonner, #52, was added to the fleet in May, 1951, a used unit, #53, was purchased from Vermont's Montpelier & Barre Railroad in 1970, and two more, Nos. 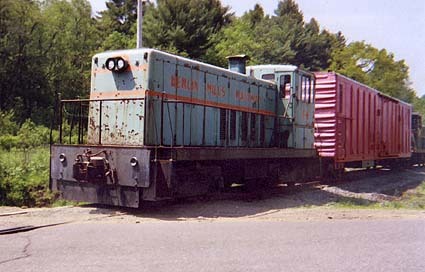 54 and 55, were acquired from New Hampshire's Berlin Mills Railway in 1987. 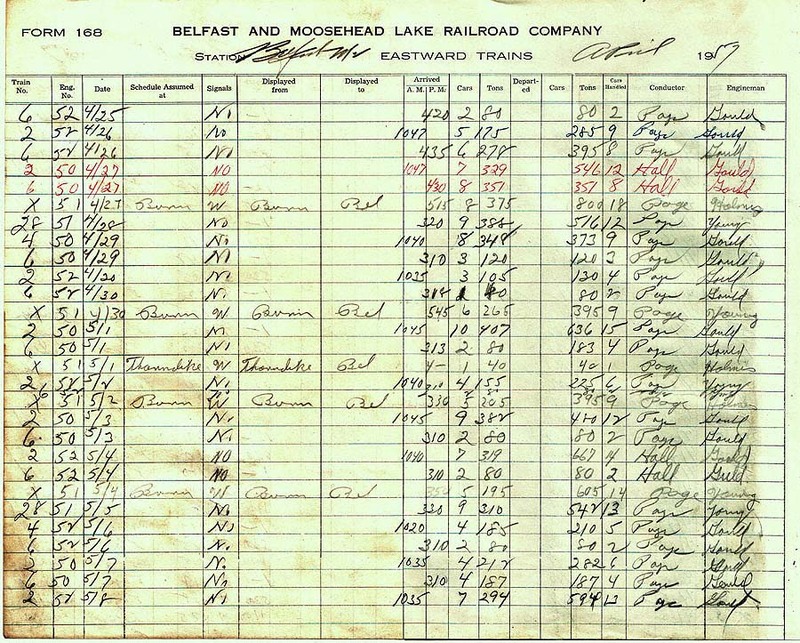 Above is an example page from the main train Dispatch Log kept at Belfast for all Eastbound trains that ran over the B&ML between April 24 and May 8, 1957, showing the number of cars and tonnage of freight carried over the line. Below is a typical day's operations on the B&ML during the diesel era as reflected in a daily station "Dispatcher's Record of Train Movements" filed by Linwood Moody, the veteran station agent at Brooks, for January 16, 1958, showing three round trips between Belfast and Burnham Junction. 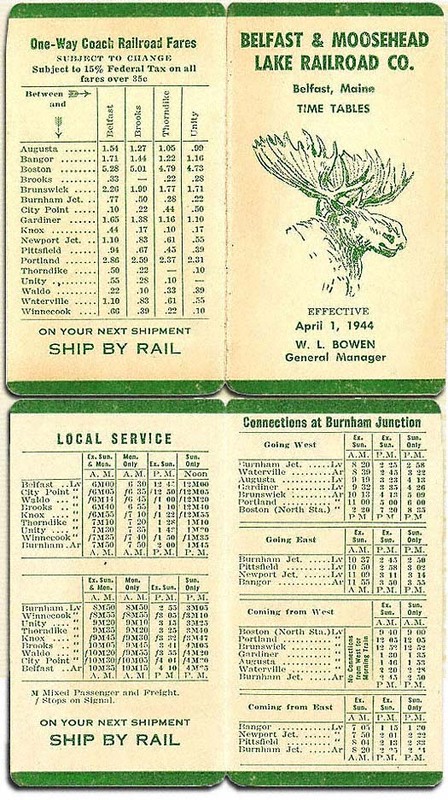 According to this record a total of thirty cars (including passenger cars) were moved Westward on that rainy mid-winter day for interchange with the Maine Central at Burnham Junction, while another twenty were picked up there to be moved Eastward to various destinations on the B&ML. 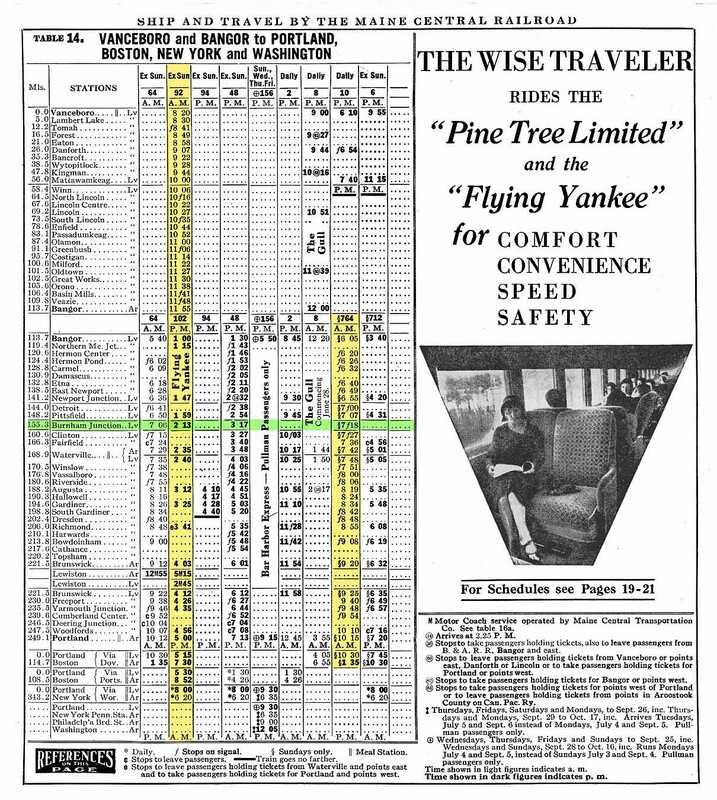 For almost 90 years (1871-1960) both mail and rail travelers from all over Waldo County took the B&ML to and from Burnham Junction to connect with the Maine Central for both Bangor and points North, and South to Portland, Boston, New York, and rail connections to the rest of North America. Over the course of almost 135 years (1871-2005). tens of thousands of car loads of freight also passed between the two roads here over the Junction's exchange tracks. In the upper left view above, a southbound Maine Central passenger run sits on the MEC track next to the lines' joint passenger station in 1955 to meet the B&ML's afternoon train to Belfast which is made up of BML#50 pulling BML #72 (exSSW #72), a baggage/RPO acquired from the St. Louis & Southwestern RR in January, 1931, and BML #11, a 1907 open vestibule Harlen & Hollingsworth built coach acquired from the Philadelphia & Reading RR (ex P&R #910) in January, 1927. (The track on the far left in this image is a MEC siding.) The upper right view shows Burnham Juction as it looks today. (The MEC main line is on the left, the B&ML and exchange tracks are on the right, and the station house stood near the tree in the distance between the tracks.) The USGS digitized and ortho-rectified aerial image immediately above shows the layout of the tracks and the yard as it appears today. The road lost other large freight customers as well during this period such as its contract for carrying bulk milk shipments for H&P Hood and Sons which ended on April 15, 1959. However as these customers disappeared others sprang up to keep the line busy, the most important of which was the growing poultry industry which needed thousands of carloads a year of bulk feed to raise its chickens. In 1961 the B&ML built its own feed mill where the old Belfast passenger station had once stood, the first such facility built by a railroad company in the United States, and leased it to Maplewood Poultry. Other new businesses sprang up along the line dealing in the likes of processing scrap leather into fertilizer in Forbes, and shipping carloads of pulpwood from Waldo. Thus as the railroad celebrated its centenary year in 1970, it had finally – albeit temporarily – become the cash cow the City had always hoped for. The nation's Bicentennial Year in 1976, in fact, was the B&ML’s best in its history. That bubble soon burst, however. In 1980 environmental concerns and soaring energy costs started to kill off Waldo County’s processing and poultry businesses which soon fled to the warmer southern states. 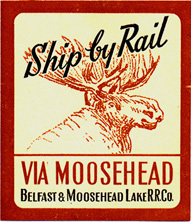 It was also proving to be more economical and faster for smaller shippers to switch to trucking companies, thus when Belfast's last chicken producer, Penobscot Poultry, closed its doors in 1989, the B&ML became a railroad virtually without customers except for a few carloads a month of perlite for a Rockland filter company. When the old Rockland branch of the MEC was reopened in 1990, however, even that small amount of traffic disappeared. That was not the end of the City’s “involvement” with the B&ML, however. When its freight customers disappeared in the late 1980’s the railroad had run critically short of working capital to cover its diminished but still high overhead operations. To “help” cover this shortfall, the City purchased the B&ML’s most valuable asset by far – the prime waterfront land on which the Belfast station and railyard had been located since 1868. As the road’s majority stockholder, however, there were more than a few raised eyebrows about the bargain price and terms the City was able to “negotiate” for this prime property. The railroad received monthly installment payments for the land for a number of years, but those funds were quickly consumed by operational expenses by the still inefficient, money losing line. When they ended the railroad was not only without its most valuable real estate asset, but was still as broke as before. The B&ML could now only continue to occupy the waterfront land under a lease with City – but only as long as the road produced enough business to satisfy City Council. If the B&ML failed to do so, the City as landlord could terminate the lease and evict the B&ML. That would be a sad day for many – but not for all. With the removal of the 1870 "Armstrong" turntable in July, 2005, and the subsequent demolition of the 1946 enginehouse in June, 2011, the only remaining major railroad structure in the Belfast yard is the old freighthouse which has served as the home of Belfast's local community theater, the "Belfast Maskers," since 1994. 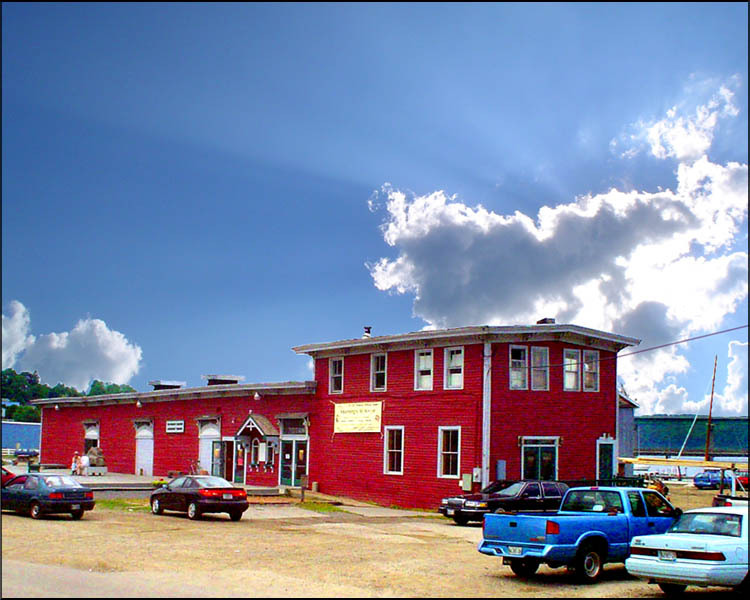 Because of continued deterioration of that building, however, The Maskers have announced plans to move to another facility by 2012 which is likely to be followed by demolition of the freighthouse as well. There were those in Belfast who would have liked nothing more than to see the B&ML become such a “fallen flag” as quickly as possible. For years a number of influential private local interests had wanted to get their hands on and develop the now City-owned waterfront property along Belfast’s busy Penobscot Bay harbor and inland along the banks of the Passagassawakeag River. For that reason the B&ML’s unexpected success as an excursion railroad under its new private owners did not please everybody, and the road’s relations with its City Council landlords often proved to be contentious at best. In the mid 1990's the B&ML was acquired by Unity businessman and philanthropist Bert G. Clifford. By this time the railroad's relationship with the Belfast City Council became so difficult that Clifford soon moved the B&ML's main base of operations 25 miles up the line to Unity where a new station, railyard, and turntable were built. While minimal diesel powered excursions continued to run between Belfast and Waldo, the long awaited return of steam to the line – powered by the “Spirit of Unity,” a 1913 vintage Swedish built locomotive acquired in 1995 – began runs out of Unity to Burnham Junction and back for the next few years. When Clifford passed away in August, 2001, however, it again looked as if the B&ML's days as an operational railroad were again numbered. The road operated on a greatly reduced schedule in the summer of 2002 while a buyer which would be willing to continue to operate the railroad as an excursion line was sought by the Clifford estate (Unity Property Management) but without success. 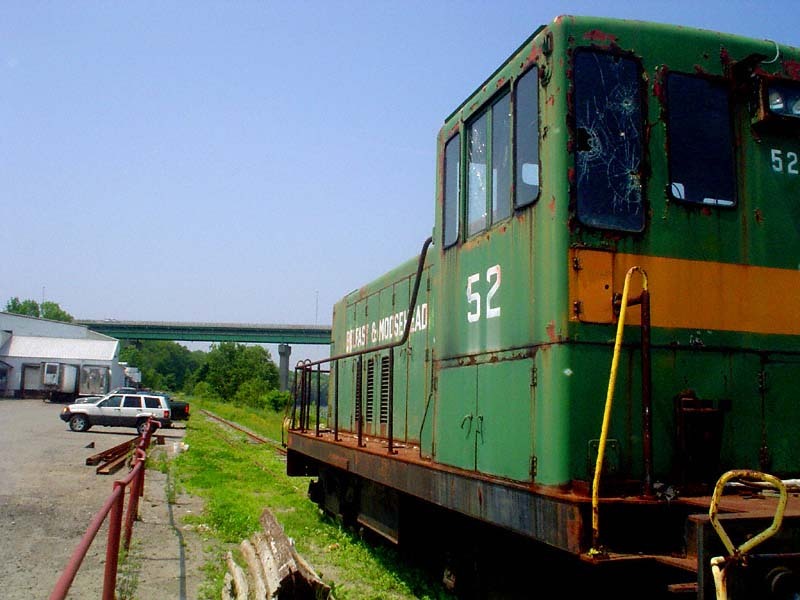 With time running out, however, a buyer finally came forward to save the day – the Railstar Corporation of Cape Vincent, NY – which entered into a purchase agreement for the road in July, 2003, and immediately announced plans to restore excursion service from both Belfast and Unity within a matter of weeks. With some success, Railstar operated a limited number of trains from both Unity and Belfast in the summer and fall of 2004, but the company then missed a number of monthly lease payments to the city over the following winter for the Belfast yard which put it in default on its purchase agreement with Unity Property Management (UPM) as well as with the City of Belfast which owned the waterfront land (as far as Pierce Street) on which the main yard was located. Thus with no operations for the 2005 season apparently on the horizon, in May, 2005, the City of Belfast gave UPM (to which the B&ML had reverted from Railstar) 30 days notice that the railroad would be evicted from the main yard which it had occupied continuously since ground was first broken for the line 127 years earlier on August 4, 1868. 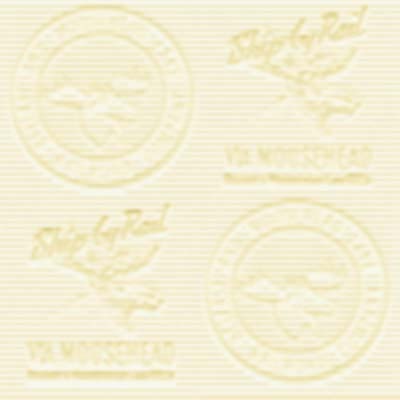 Like the Nation's venerable first Pacific railroad, the colorful history of the development, construction, and operation of the Belfast & Moosehead Lake Railroad spans more than a century and a half. Over that time the line has survived countless setbacks the likes of which have long ago killed off hundreds of other roads, large and small. However through political scandals, financial panics, blizzards, fires, bridge washouts, wars, the great Depression, lost leases, and closing industries, the plucky B&ML managed to hold on to its hard won 33 miles of track for 125 years. While it may now finally become just another "Fallen Flag," since the last train left the old Water Street yard, several other potential operators have expressed interest in finding a way to save the B&ML – including the highly regarded City Point Central Museum owned and operated by Mack Page, Sr., a fourth generation B&ML railroadman – so just maybe the old "Broken & Mended" may yet still have another life left in it! After 125 in service turning countless MEC and B&ML locomotives from one track to another, the venerable man powered "Armstrong" turntable at MP 0.0 was removed and the pit unceremoniously filled in in June, 2005. The long derelict 1951 vintage BML#52 sits forlornly as an exiled silent sentry just outside the Pierce Street yard limit at Belfast, ME. Except as noted, all exhibits and illustrations courtesy Bruce C. Cooper collection. Although a lifelong Pennsylvania resident, author Bruce Cooper's unbroken family roots in Waldo County and the Penobscot region go back to 1759. A long time summer resident of Belfast, he has spent many hours riding the B&ML between Belfast and Burnham Junction over the years. Not affilated with the B&MLRR.